Cinch up your waist and drape your curves with the sharply structured tailoring of this insanely chic maxi dress with sleeves that graze the elbows with their ¾ length. This highly versatile clothing staple will always delight you with its comfort and super-functionality. 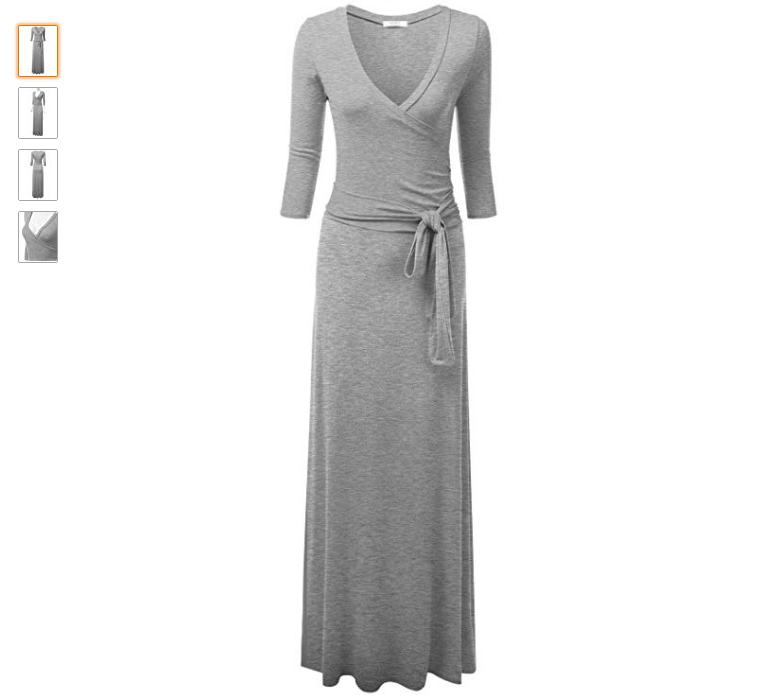 This wrap-around style maxi dress with sleeves features a contemporary design that exudes a sharply structured, minimalist elegance. If you are one of those women who appreciate the charm of low-key designs and plain colour palettes, you’ve found a glorious fashion bargain! It features a soft fabric pull-on closure that allows you to slim down your waist and flaunt your curves with an elaborately structured sensuality, which is perfect for both, formal office wear and casual streetwear. The subtle charm of this maxi dress makes it a highly versatile silhouette that will delight you on days you don’t want to spend hours in front of the wardrobe, contemplating over what to wear. You’ll be delighted to find out that this maxi dress with sleeves comes in an excitingly wide variety of colours and sizes. You get to choose your maxi dress from a glorious pool of 16 vibrant and eclectic colours, including charcoal, red, orange, pink, burgundy, grey, black and many more. Woman of all shapes and sizes can enjoy this elegant silhouette, this includes athletic women, apple shaped, pear, hour glass and even plus size beauties. 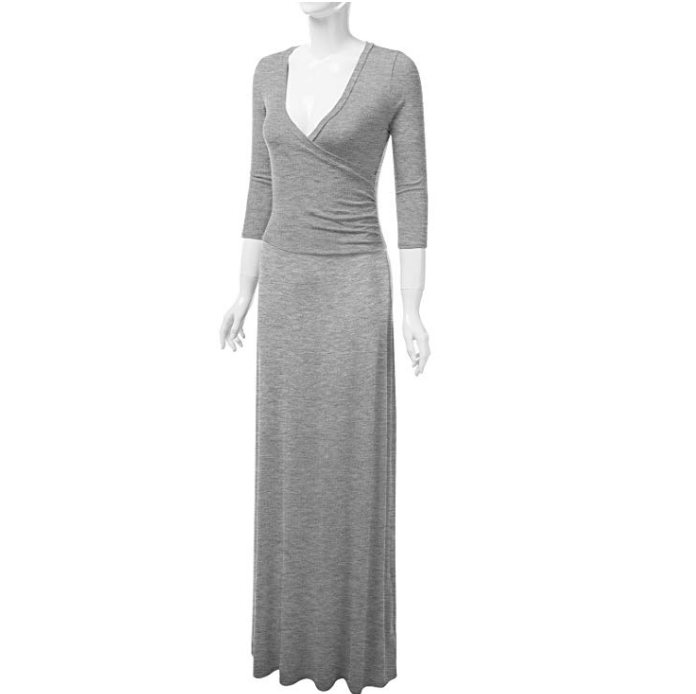 This maxi dress with sleeves is available in sizes ranging from 3x small to 2x large. This maxi dress with sleeves is a token of elaborate tailoring, fine quality fabric and contemporary designing. 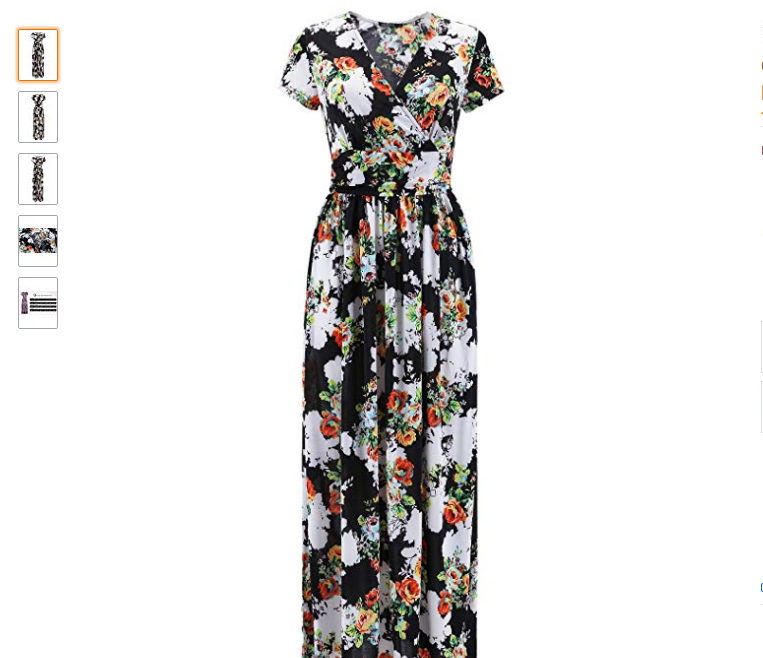 It features 95% rayon and 5% spandex, which makes this maxi dress super-breathable, comfy and stretchy so you can flaunt your curves without being uncomfortable. This basically means that you can flaunt this voguish delight throughout the year for it is functional for both, scorching heat and chilly winds. You can grab this fabulous fashion bargain with a budget-friendly price tag that ranges from $15-$21, providing you both versatility and fine quality without breaking the bank! Styling up versatile clothing staples is always a joy, and this delightful maxi dress with sleeves can be put together in various different outfits without putting too much effort. For a simple yet elegant statement, pair it up with a chunky string of pearls, and a sharp pair of dark pumps. If you want to create a sassy athleisure statement with this maxi dress, pair it up with your trendiest sneakers and add a bomber jacket to seal the look. You can also flaunt this maxi dress on an exotic vacation, for it is perfect for street trotting and sightseeing when paired with exotic boho espadrilles. If you want to make it sharper for workwear, pair it up with sleek pumps and a sharply structured dark blazer. You can also flaunt this delight with your denim and leather jackets while creating streetwear looks.